My co-worker, Aaron Carlson, posted this on Teams and gave me permission to share what he wrote. 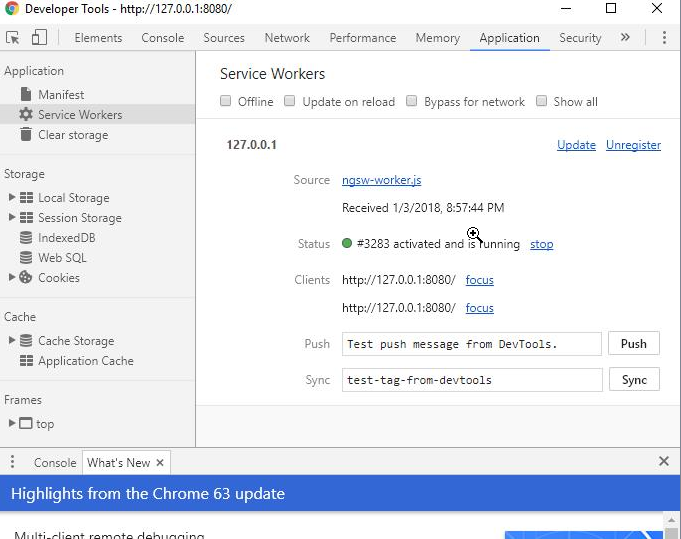 I was able to successfully create an Angular 5 app with Service Worker. It was pretty simple. The trick seems to be that you need to serve the application from the dist folder using “http-server” instead of using “ng serve”. This doesn’t hook up the browserLink functionality but the application will still work even when you stop the http-server. There must be a way to have the service worker running separately from the application so that you can develop the app with the BrowserLink, but I haven’t been able to figure that out yet. it will startup and show where to browse to it. in dev tools, open the “Application” tab and you should see the service worker. The information was found here. We’re very interested in PWAs and have been learning a lot, when we can find the time. We think this a great set of technologies for building web applications. Checkout my (Kevin) list of PWA links.